Is your organization aligned and consistently executing strategy to achieve success? Is your workforce engaged and held accountable? In part one of this series, we discussed the “why” of healthcare and providing the best patient care. In this Insight, we will explore Evidence-Based LeadershipSM, the proven framework that helps leaders build sustainable cultures that promote accountability, foster innovation and consistently deliver a great patient experience and the best quality outcomes. Evidence-Based LeadershipSM (EBL) is the “operating system” that provides a framework for organizational alignment and accountability. EBL also includes a wide range of tools and tactics – the “apps”. Several senior healthcare leaders were on hand at Studer Conferences Toronto to demonstrate how EBL is being used in practice. Michael Heenan, vice president, quality strategic information and performance systems, St. Joseph’s Health Centre Toronto, urged delegates to view Accreditation as a “process” rather than an “event”. 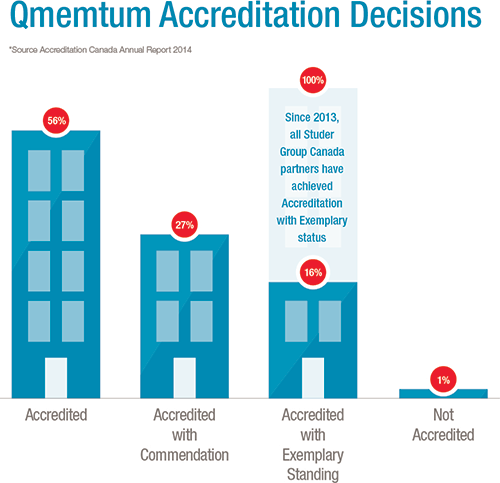 At St. Joseph’s Health Centre Toronto “Accreditation equals Evidence-Based LeadershipSM” – rounding, communication and reporting tactics are applied daily to achieve results across a range of metrics, including those essential to Accreditation. St. Joseph’s is one of many organizations using this approach: 100 percent of Studer Group Canada partners surveyed since 2013 have achieved Accreditation with Exemplary Status, compared with just 16 percent of all organizations surveyed nationally. Thunder Bay Regional Health Sciences Centre launched a program of patient and family centred care in 2007, built around trained patient and family advisors. Bonnie Nicholas, patient and family centred care lead and patient advocate, and Keith Taylor, patient and family advisor, described program operations, lessons learned and successes to date, including several prestigious awards. A partnership with Studer Group Canada has been formed to hardwire practices and optimize outcomes. Ila Watson, vice president transformation and chief human resources officer, Sault Area Hospital, outlined how Lean methodologies, in particular the alignment and clarification of leadership roles, help leaders focus on the results they are best able to influence. SAH, a Studer Group Canada partner since 2007, has leveraged EBL by creating a foundation of cultural readiness to hardwire and optimize Lean practices. Hôpital Montfort in Ottawa is the first organization in Canada to implement Studer Group Canada’s Emergency Department Intensive Coaching Program. Lucille Perreault, vice president clinical programs & CNE, and Nathalie Boudreau, director project management and change described a set of EBL tactics, including AIDET®, rounding, team huddles, dashboards and monthly meetings, along with specialized evidence-based ED flow methods. Rapid improvements in wait times, cost per visit and patient ratings of quality have earned Montfort a Studer Group Most Improved Metrics Award. Studer Group Canada coaches, all with deep clinical and health leadership backgrounds, were also available at the conference to describe and answer questions about EBL practices. Karen Bennet examined the details of patient communication tools such as AIDET® that improve satisfaction ratings and also have been linked to better clinical and safety results. Lisa Shiozaki focused on transitions from hospital to home. Again, evidence-based practices drive improvements in patient satisfaction and safety, while supporting care pathways and ultimately clinical outcomes. Maureen McCafferty showed how rounding tactics enable leaders to “play offense, not defense”, and outlined methods that improve engagement and performance by collecting vital information, building relationships, validating behaviours and rewarding success. Next week, we will focus on the key role of physician leaders in this process, providing some in-depth perspectives from notable physician leaders.